The 2015 Lincoln MKX is based on the Ford Edge but separates itself from its mainstream sibling with upscale amenities that include leather seating, climate-controlled seats and a strong V6 engine. The MKX comes with many creature comforts, but this model is aging and set for a revamp. If you're seeking an American-branded midsize luxury SUV and the Cadillac SRX doesn't suit your style, the Lincoln MKX could be the upscale hauler for you. The MKX also impresses with a standard V6 and creature comforts such as heated/ventilated front seats and leather interior that cost extra in competitors. If you want the higher fuel efficiency that comes from a hybrid, diesel or smaller engine, look beyond the MKX to a Lexus RX, Audi Q5 or Acura RDX. Rivals also boast safety systems like pedestrian detection and automatic braking (Volvo XC60) and cutting-edge technology (Audi Q5) that the Lincoln can't match. With an all-new Lincoln MKX likely not far off, the 2015 model carries over unchanged. The 2015 MKX SUV's wide exterior translates to a spacious 5-passenger cabin that includes 39.6 inches of rear-seat legroom. All models feature leather seating, and wood trim is available for a more traditional look or, conversely, a carbon-fiber weave for a more modern approach. For cargo flexibility, the rear seats fold in a 60/40 split. In front, the passenger seats are separated by a wide armrest. The instrument cluster houses twin, customizable 4.2-inch screens. And then there is the prominent 8-inch color screen in the center of the dash. The Sync with MyLincoln Touch system looks impressive, but operating it is anything but simple. The Lincoln MKX has the same basic shape as its Ford Edge sibling, but ups the bling factor thanks to a massive split-wing grille in front and shapely, wraparound taillights in back. At 87.5 inches across, the Lincoln MKX is wider than competitors. This gives the Lincoln a strong, squat appearance, but that width is felt by the driver when trying to maneuver into tight spaces or a cramped garage. Even entry-level, front-wheel-drive MKX models ride on 18-inch aluminum wheels, with massive 20- and even 22-inchers optional. The 2015 MKX's road manners are similar to its personality in general: It's not jaw-dropping in any particular category, but it also doesn't fail in any of them. Acceleration, handling and comfort are above average, though not best in class. When equipped with all-wheel drive (AWD), the MKX shuns the torque steer sometimes evident on the front-wheel-drive (FWD) models, which can feel like the steering wheel is tugging away from your hands. The optional AWD system also lends an added measure of safety on slick roads and in winter driving. The MKX's high seating position is appreciated, although we can't say the same for the long dash that impedes forward views. Lincoln's premium crossover SUV is most happy at highway speeds where it cruises effortlessly and quietly. The bigger wheel and tire options (20 and 22 inches) somewhat improve handling but also return a firm ride that we don't think is worth the trade-off. The 2015 Lincoln MKX has a Manufacturer's Suggested Retail Price (MSRP) starting just under $39,800 for a front-drive base model. Mid-grade trims with the Premium package begin just over $42,700, while top-line versions dressed to the hilt with the Elite package arrive just over $45,500. Adding all-wheel drive to any model is about $2,000 extra. With all options, a top-line MKX can pass the $50,000 mark. At its base price, the MKX sits above the lower-priced Acura RDX, Infiniti QX50, Volvo XC60 and Land Rover LR2, and in line with the Lexus RX, Mercedes-Benz GLK, BMW X3, Audi Q5 and Cadillac SRX. Before buying, be sure to check the KBB.com Fair Purchase Price to see what others in your area are paying. The MKX's resale value is expected to only be average, trailing leaders such as the RX and Q5. Climate-controlled front seats (and leather upholstery all around) are among several standard MKX amenities that can be costly options in its competitors. Also standard on a base 2015 MKX are a power liftgate, 10-speaker AM/FM/CD audio system with dual USB ports, Bluetooth wireless communication, remote start system, dual-zone climate control and push-button start. There's a reverse-sensing system, but surprisingly, no standard rearview camera. For our money, the best value is the mid-level MKX with Premium package. The extra $2,950 nets you that rearview camera along with blind-spot monitoring, heated rear seats, heated steering wheel, rain-sensing wipers, high-intensity-discharge headlights and power-adjustable steering wheel. Those wishing for a fully decked-out MKX can get the Elite package, which includes voice-activated navigation, THX II-certified audio system and panoramic moonroof. Other options vary by trim and include a nav system, adaptive cruise control and 20- or 22-inch wheels. Rear-seat entertainment can be had via headrest-mounted screens with DVD player, wireless headphones and inputs for other devices. Those wishing to tow can get a prep package that enables the MKX to tow up to 3,500 pounds with trailer sway control. All Lincoln MKX models can be had with traction-enhancing all-wheel drive instead of the standard front-wheel-drive setup. Included on mid- and top-trim versions of the MKX, Lincoln's blind-spot monitoring system is an important safety feature that can help avoid collisions with traffic out of the driver's line of sight. The system also features rear cross-traffic alert to warn of approaching vehicles when you're backing up. Usually an expensive option on most luxury SUVs (if offered at all), the MKX comes standard with front seats that can keep you warm in the winter and cool in the summer. All versions of the 2015 MKX use a 3.7-liter V6 that makes 305 horsepower, among the most power in this segment. The sole transmission offered is a 6-speed automatic that can be shifted manually with steering-wheel-mounted paddles. The MKX comes standard with front-wheel drive (FWD) or optional all-wheel drive (AWD). Not that long ago, this Lincoln's fuel-economy figures of 18/26 for FWD and 17/23 for AWD were lauded, but today competitors such as the Acura RDX, Audi Q5, BMW X3 and Mercedes-Benz GLK all best it. In fact, diesel models of the Audi, Mercedes and BMW reach past the 30-mpg mark, with the BMW X3 diesel hitting 34 mpg/highway. If it's any consolation, the Lincoln MKX runs on regular unleaded. 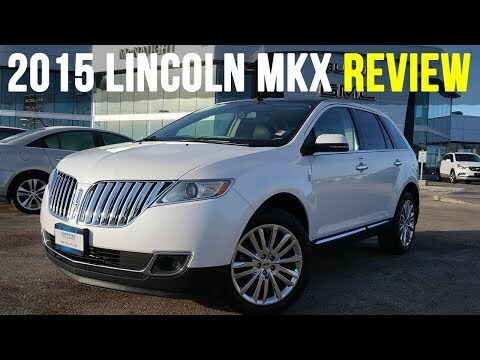 The 2015 Lincoln MKX is a 2-row, 5-passenger luxury crossover SUV that vies for attention in a segment that includes bestsellers such as the Lexus RX, Audi Q5 and Cadillac SRX. The MKX is based on the Ford Edge but separates itself from its mainstream sibling with upscale amenities that include leather seating, climate-controlled seats and a strong V6 engine. Starting just under $40,000, the MKX is priced similar to rivals but is well-equipped and simple to build and option. The MKX may have some appeal as an American luxury SUV (though it's actually made in Canada), but there's no denying that this Lincoln is showing its age compared to newer rivals that have better fuel efficiency, easier-to-use technology and more advanced safety features. Amazing car. Not envy with the Europeans car. Is a very comfortable car, very good in mileage for a SUV. The ride is very smooth and with good acceleration. The interior is very elegant with all the features you want. I never had any problem with the car and when I go for service they do the work very professional and very fast. I cannot say anything bad about it. The navigation screen is very nice and user friendly. I have nothing bad to say. It drives very nice and without issues. The only complaint I might make is you cannot change your turn signal without taking in the vehicle. Sometimes the button to the shifter sticks and the vehicle does not register being in park. Pleased first time owner of a Lincoln. No problems as yet. Having a problem with the door lock but will have it repaired at next service. The service department always provided dependable efficient service.